Tissue Procurement: Human meniscus tissue is collected from cadaveric donors within 48 hours of death or as surgical specimens from a relevant procedure. The tissue is harvested from the knee joint from both clinically “healthy, normal” donors and from those diagnosed with rheumatoid and osteoarthritis. Proper consent and serological information is obtained on all specimens. 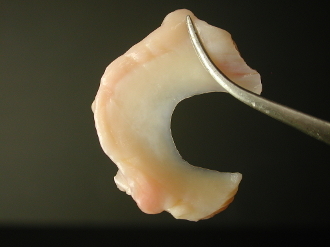 Tissue Processing: Human meniscus tissue is aseptically dissected from the knee joint. Fresh meniscus is placed in sterile medium containing 10% FBS and shipped overnight with ice packs. **This item requires fresh tissue. The order will be filled as soon as the appropriate donor tissue is available. Please inquire at 847.498.9634 to request an estimated wait time.